Houston TX was first to recieve the tags. So I have been involved with Google tags for a little while now, since the beginning. Today Google announced that the sponsored tags for businesses would be no more. Honestly I hate to see these tags go. Google Boost has a lot to offer. And Google Boost has a lot lacking. From my perspective, what it lacks most is similar to what Google’s sponsored tags lacked, CUSTOMER CARE. Or better yet, what Guy Kawasaki stated, “IF you want your customers to trust you then you need to trust your customers.” There is a serious problem when a paying customer following Google’s guidelines gets a “Place no longer exists.” branded below a business name, simply because their trusted anonymous user says it to be so. And there are a myriad of other issues that Google’s local search team is also suffering much of it seems to stem from a trust factor and or customer care perspective. But…. Google’s local search is still the best out there! Heck, Bing isn’t even taking reviews right now. Plus Bing’s maps are horrible for embedding. So here is my biggest complaint, Google wants to get rid of an nice entry level platform for Local businesses, the Sponsored tags. In it’s place they want to push, Google Boost. The reason this doesn’t look good is because the customer care part still doesn’t exist. But it looks even worse because the song I am hearing from Google is, “What’s going to make Google the most money? That would be Google Boost… So we have decided that Boost is what’s best for our customers.” “We know what’s best for you?” “Just Trust us?” That’s a pretty big step for business owners to take. Trust is most often built with time and history. One step at a time. Anybody that would marry after a first date is considered “NUTS”. Building a business relationship is the same way. Will Google Boost work? Is it good for local businesses? I would like Google boost to work for local businesses. But, it’s a completely automated system. As much as I trust the auto pilot on an airplane, I still need to be reassured that their is a real pilot to correct it’s mistakes. Do the math. But I am just your local pest control guy, so don’t mind me. Most believe that this is to increase revenue. But does it not also devalue the top 10 spots as well? If the goal is only to get on the first page then that 11th spot for a cheaper click is better then the 10th spot. So will it mean more revenue? I don’t believe that Google will sell themselves short. It may not mean any more revenue but it won’t mean any less. It could just mean more information. Information is king. Google thrives off of information. The added options on the left do make the new layout more interesting and perhaps divides up the pie a little more. Having an image that ranks well for your target search just increased in value. Having a video for your keyword search just increased your chance of getting noticed. Having a blog or news spot, (news is relative, and I am shocked at what is deemed “news worthy” in the pest control industry)… none the less, if you can get Google to post your content in any one of these off shoots then it is going to improve your online marketing efforts. And hey, I don’t mind picking up the 11th man spot on the sponsored side. Better to be 11th on the first page then 1st on the second page. Google is evolving and it’s Business center has morphed into GOOGLE PLACES. Perhaps Google Places is the appropriate term as Google is excluding business without a physical place. As one blogger put it, “They are more concerned about the piece of dirt.” and so far that point is accurate as Google maps will only show businesses with a physical location within the city proper for competitive search terms. Today those yellow tags come with a price. Sponsored tags. Google sponsored tags cost $25 a month, for the test phase at least. At $25 last month I got 34 actions, and 19 clicks to my website. Perhaps just from curious onlookers, but perhaps those were clicks that would normally cost me $2. If that’s the case then the sponsored tag worked. But if they end up like the phone books and want to charge me more and more and more, and the market becomes more and more saturated, and if they can’t show more detailed numbers, then it will be hard to keep spending that money. Especially when it is unclear if the Impressions are just from Google Search and Google Maps, or if the impressions are from all pages on the internet that show that map, like my contact page. The strength of the internet is the honest openness to numbers. And numbers are the ultimate law. So far the numbers Google provides are impressions and actions. Actions to Impressions (ATI) would be similiar to Click Through Rate (CTR) except a click to the website is only one of the calculations. ATI is a good feeler as to what is happening but I am under the impression that a lot more people are just picking up the phone and dialing, especially when that phone call is only a click on your IPhone. (Mobile calls would be a great addition to that action list). I would love to put a call tracking number into my LBL but due to the complexities Google has of compiling a ton of location data that is seemly incongruent, the telephone number of your listing has become a key, if not the key, identifier as to who you are on the local web, and who is referencing you. In Google maps each and every instance of your name associated with an address, and phone number is being weighed with or without a link and without your website. We will call these Instances so as not to be confused with citations or references, both of which have HTML codes. Instances on the other hand are not meta tag mark ups with an open and close tag, they are simply each and every time your business name is associated with a physical location. This would include tweets with locations, GEO tagged photos with your business name, the restaurant down the street that references your party on their blog containing their address at the bottom of each page, or even better yet, a review on a competitor’s map listing mentioning how much better or worse you are. That one review will link, loosely, but none the less, link you to your competitor’s address. 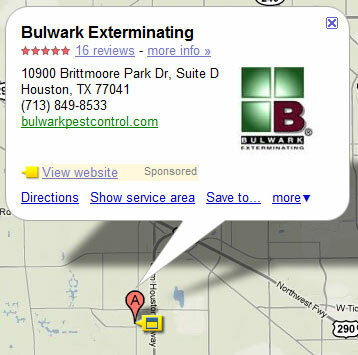 Many local exterminators will miss it.